When you can successfully roll 10 out of 10 times, and want to learn something new, it's natural to start to occupy oneself with what I call advanced support techniques. Dels er det morsomt å lære nye ting, dels gir mestring av disse teknikker særdeles god kontroll over kajakken og ekstrem trygghet i vannet, og gjør deg således til en tryggere padler. The terms ”sculling”, ”side sculling” or in Greenlandic ”Innaqatsineq” mean lying on your back in the water, with your face just above the surface (while still sitting in your kayak) and staying afloat by means of a sweeping movement with the paddle from side to side. The paddle is held asymmetrically, and angled slightly upwards towards the surface, so that it always seeks upwards. When you find your balance and understand the technique, it's incredible how little effort is necessary to stay afloat. To learn the exercise, a helper is necessary. As with rolling practice, your comfort is also important to your success. This means warm clothes, a nose clip and whatever else you may need to feel fine in the water. (See also the article about learning Eskimo rolls). It's also important that your kayak is fitted to you, so that your thighs are wedged snugly against the kayak hull, and so that you can brace firmly with your knees. A helper can stand in the water and support you when you lean into the water. If you try sculling on your right side first, the helper should stand on your right and hold a hand under your right shoulder. As you grasp the position and the technique, the helper can support less, until you manage by yourself. First try to relax completely. You mustn't focus too much on staying up to begin with. Get a feel for the water, and try to convince yourself that it's quite nice to lie in the water this way! Brace your feet against the footrests, and wedge your knees so that you control the kayak. Try to roll the kayak away from you, so that it lies closer to upright than sideways. Your upper body, and especially the head, is still partly under water. Only your face has to be in the air. Hold your left hand all the way out on the paddle blade. This is just to support the paddle, which is held close to the stomach. The right hand and arm should hold the paddle shaft tightly and control the movement of the paddle. Try to steer the right paddle blade all the way up to the surface. Then try to move it forwards, at a slight upwards angle, so that it will rise. Once it's forward, twist the blade so that it's pointing upwards when you move the blade backwards. Keep moving the blade forwards and backwards, and change the angle every time you turn, so that the paddle always rises. Try to take long, slow strokes, which are more efficient than short, fast strokes. 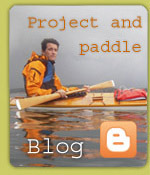 (picture above) The kayak is rolled towards the upright position with the hips, the paddle has just reached the turning point, and is about to be rotated for the return trip. (above) The paddle is on its way backwards. Note the angle of the blade. The paddle blade has reached the rear turning point, and is about to be rotated again to go forwards. When you're comfortable with innaqatsineq you can take the next step and not move the paddle at all, and find your balance with the paddle at rest. 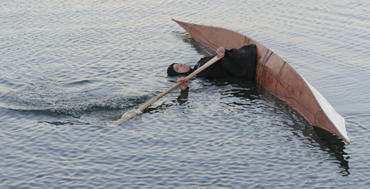 This technique was originally used in Greenland to rest, if you were tired from paddling a long time and couldn't get ashore. Some say it was for sleeping, but I don't know anyone who's tried to sleep in this position, and I find it hard to believe that this is possible. I'll try it one day when I'm really tired! I use a variation of the original resting exercise first, to learn the technique. This is a variation with an asymmetrical grip on the paddle. Later you can move on to the original ”nillassanuq”, where the paddle is held in a symmetric grip. I start here by tipping over to the right. You start by holding the paddle behind your head. The left blade touches the back of your head, the left hand holds the outer end of the blade and the right hand holds the transition between blade and shaft. Rotate your upper body about 45 degrees to the left. Push the paddle blade upwards in the air, and the left hand will move slightly downwards towards your left shoulder. Let yourself down into the water. Then try to turn the kayak to the left, at the same time as you lean backwards and arch your back. As with ”innaqatsineq”, you should have a helper standing in the water to support you the first time. If the paddle sinks downwards you may be holding it too hard. Loosen your left-hand grip a bit and move your right hand further up. Additionally, it's important that there's no weight pressing downwards. As long as most of your upper body and head is under water you're fairly buoyant. If you turn the kayak away from you at the same time and bend your back backwards, the buoyancy of the paddle should be more than enough to keep your face above the water. (pictures above) Here you lie in perfect balance. Arch your back and twist the kayak with your hips. When you've mastered this floating exercise with asymmetrical grip, you can move on to the original – ”nillassanuq”. Here you hold the paddle with the shaft behind the back of your head and with your hands in a paddling position about the shaft of the paddle. Turn your body a bit more to the left, lean backwards and put the left paddle blade just into the water on the right side of the rear deck. Let yourself down into the water and slide the left paddle blade under the right side of the kayak. The left blade goes high up in the water surface, the back bends backwards, and the kayak turns towards the left. Bingo!!!! or…… Maybe this should also be tried with a helper alongside? Good luck! (above) Starting position for nillassanuq. The paddle blade under the kayak, the shaft behind the head and the other paddle blade in the water – sleep well!